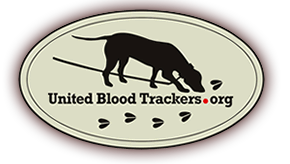 United Blood Trackers is dedicated to promoting resource conservation through the use of trained tracking dogs in the ethical recovery of big game. We support recovery efforts afield, the education of hunters, the training and testing of dog handlers and their dogs, and legislative efforts to promote blood tracking. Making hunters and future handlers aware of how a good tracking dog can reduce the loss of big game. Providing support to handlers training their dogs. Encouraging our members to assist hunters with lost game recovery afield. Sharing information and advice with those who seek to establish the legal and ethical use of tracking dogs in their own states. Sponsoring testing opportunities for those who would like to document the capabilities of their dogs. Organizing blood tracking workshops as a means of promoting excellence and encouraging fellowship among members.